Here are the average home equity rates from Bankrate’s weekly survey of large banks and thrifts. Refinancing into a low-rate HELOC for the short term could depend on what the Fed does. There’s more than one way to finance a new car. Ponder these points before choosing one. Plan now for an environment of rising interest rates in 2011, experts advise. 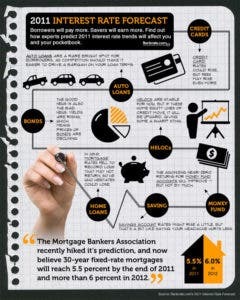 Plan now for an environment of rising interest rates in 2011. In an uncertain market, should you sell your home before you buy another? It’s tough to get a HELOC in this housing market. Go for a personal line of credit instead. Mortgage professionals offer their predictions of five key housing trends for the rest of 2010. Serial refinancing is not ideal, but it’s hard to argue with locking in at today’s low rates.